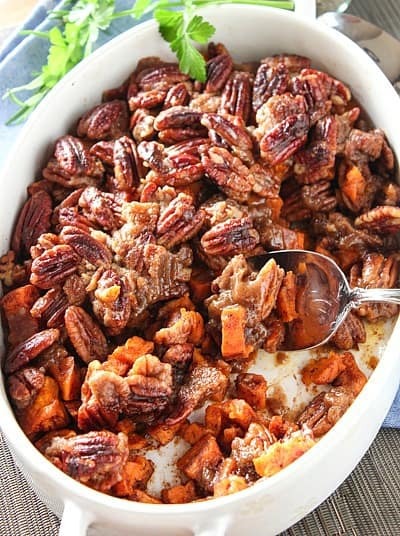 Roasted Sweet Potatoes with Cinnamon Pecan Crunch! You get the whole flavor of roasted sweet potatoes in this dish! Roasted Sweet Potatoes with Cinnamon Pecan Crunch Hot and Ready to Serve! Nothing brings out the flavor of veggies like roasting them! I love the fresh taste of the potatoes in this dish. You can actually taste the sweet potatoes in your sweet potato casserole…what a concept! The topping is plenty sweet with brown sugar, cinnamon and pecans. A great mix of fresh and sweet. Super easy MAKE AHEAD holiday side dish! Just peel, dice, and roast your sweet potatoes for about 25 minutes. Mix up the topping – you don’t even chop the pecans! Takes two minutes to assemble. Bake right away or wrap it up and store in the fridge for up to two days. My family went sweet potato crazy over this and I think it’s the fresh taste that won them over. This serves about 8 people but you can easily double…or triple! Feeding the world with fresh sweet potato casserole! Need more MAKE AHEAD dishes for the holidays? Make Ahead Mushroom Gravy – with a deep mushroom flavor. Make Ahead Cheesy Potato Casserole – Made with frozen hash browns, so easy! And for your holiday breakfast – Make Ahead Mexican Tortilla Breakfast Casserole! A full flavor sweet potato casserole that can be made ahead of time! Line large baking sheet with parchment or foil for easy clean up. Spread out cubed potatoes, toss with olive oil. Bake for about 25 minutes or until firm when poked with a fork and edges are browning. Turning once or twice while they roast. In a small bowl, combine 2 tablespoons brown sugar, 1/2 teaspoon cinnamon, 1/4 teaspoon salt and pinch of pepper. Toss with cooked potatoes. Butter an 11 x 7 casserole dish. Add roasted sweet potatoes. For the topping: In a medium bowl, whisk the flour, brown sugar, and cinnamon together. Fold in the melted butter and pecans until the mixture is totally combined. Spoon evenly over potatoes. 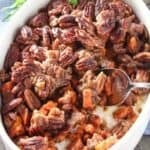 Bake for 30-35 minutes until pecans are lightly browned. I love the combination of creamy and crunchy in this casserole. It’s perfect for any dinner! 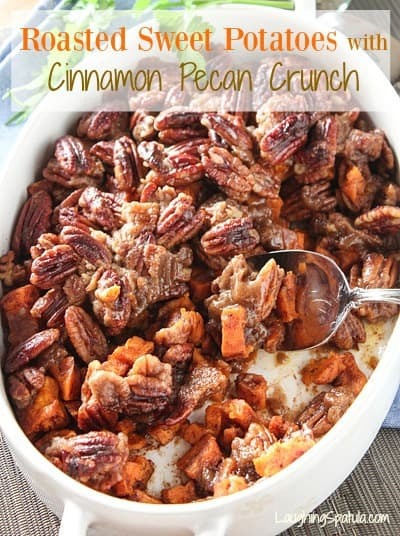 I love that you used whole pecans not only for the extra crunch but for the lovely presentation, too! This looks so scrumptious!!! Thank you Abigail! I like to think its a little healthy with the roasted potatoes…but maybe not? Thanks for your note! It looks delicious. I love that it can be make ahead! Great side dish for Thanksgiving! Looks perfect ???? I’m definitely making this recipe. Thanks for sharing ???? Yum, Yum Yum….this is my kind of recipe for the holidays. Easy to make in little time and tastes delish! I’m excited to see a sweet potato casserole without marshmallows! Yay! I love that the potatoes are roasted too! Never liked vegetables until I started roasting them, now I can’t get enough!! But never thought of roasting the sweet potatoes for a casserole. Pinned & am going to try it!! Thank you Chris! I hope you get a chance to give it a try! Oh wow this looks delicious thank you for posting will be trying this Sunday!! LOVE Make-ahead dishes! I love sweet potatoes and like to be able to taste them too. This looks SO good. Thanks for the nice comment Kylee!